As If… | gather the folks. tell the stories. Today was bittersweet. I was back with the good folks at Christ Presbyterian Church by the Sea in Broad Channel, Queens, for the first time in a month, and I am beginning to say my goodbyes (or, as I hope will be the case, my so-long-for-nows). They have found a pastor! She will be ordained and installed in the coming weeks and will move into the steady leadership and constant presence that Christ by the Sea so needs and richly deserves. It has been my privilege to walk with them just a little bit along the way while I discern my own next steps, and I will miss them dearly. 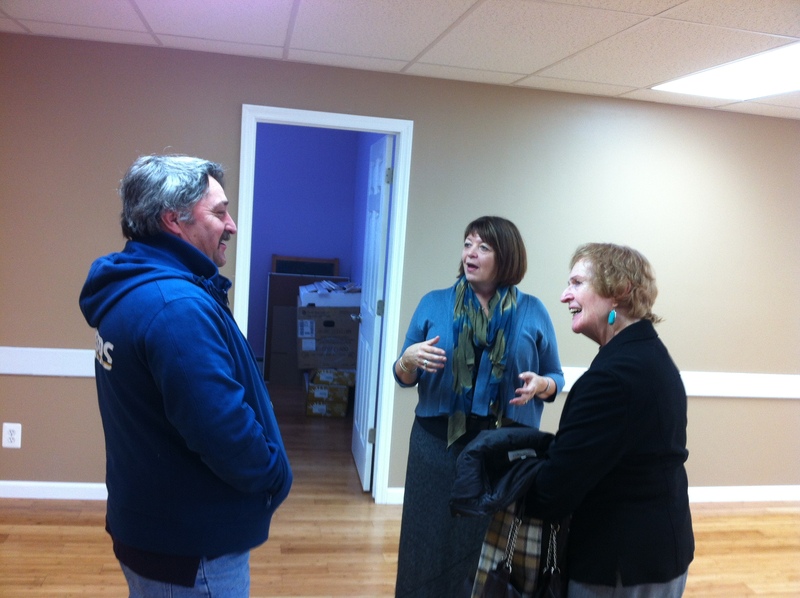 Laurie hearing the ‘real’ story behind the renovations from Don and Margaret. 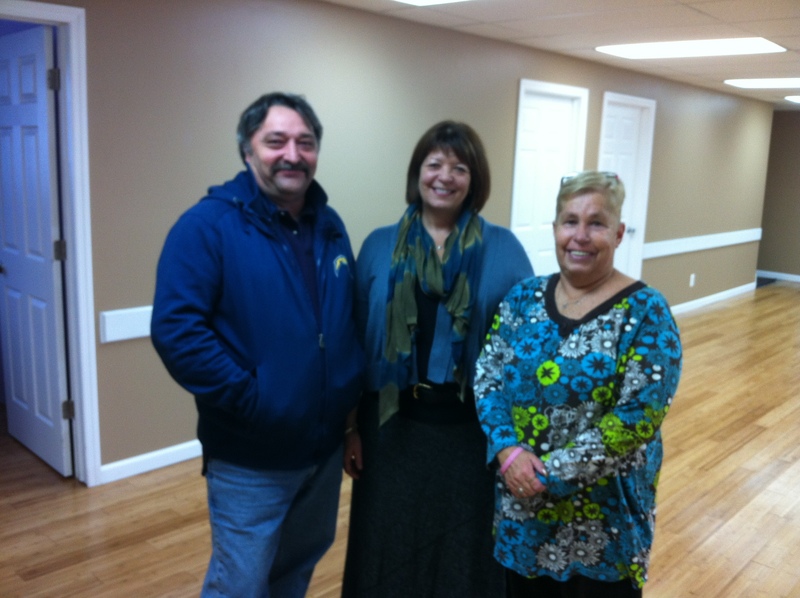 Laurie with church members Don and Joyce (the Clerk of Session). Today was also the day when we welcomed Laurie Kraus, Coordinator of Presbyterian Disaster Assistance, the relief arm of the Presbyterian Church (U.S.A). She arrived to bring greetings from PDA and to tour the newly renovated sanctuary and fellowship hall. PDA grants and volunteers provided enormous support to Christ by the Sea after their campus was devastated by Super Storm Sandy in October 2012. Unlike other relief organizations that show up in the first days after a natural disaster and then depart with the news outlets, PDA shows up and stays… and stays… and stays. Months and even years after an event. It is a testament to their understanding of what longterm recovery means for individuals who have lost homes, and for communities who have lost hope. I think Laurie was impressed. Y’all! You have a new pastor! [i] This is good news of great joy this Advent season! You have found in Deb a partner in ministry- someone who will walk with you into Christ by the Sea’s future. She will accentuate your strengths; she will add her own; she will explore new things with you and accompany you as you encounter your learning edges. She will be here week after week, offering you the constancy that only an installed pastor can. She will take care of you; she will celebrate your joys and grieve your sorrows. She will preach a good word and she will break bread and bless the cup with you. She will orient new members and baptize new babies; she will sit at your bedside when you are ill; she will bury your loved ones and raise high the good news of our resurrection in Christ; and maybe she’ll officiate a wedding or two. In like manner, you will be a sustaining presence for Deb. You will care for her as she lives into her first ordained call. You will grant her grace and flexibility as she balances her work life and home life, moving from Manhattan to Queens and back again. You will tell her what you need, since she will not be a mind reader. You will ask for her help; you will offer her suggestions; you will let her know when there is division among you. You will celebrate her joys and grieve her sorrows. You will continue to volunteer your time, your energy, your gifts and your money, for the sake of the church’s vitality. Together, you and Deb will give and receive. You will love and be loved, in kind. You will experience conflict, and you will work for reconciliation. You will give thanks to God continually, and you will remember that you are, together, the Body of Christ, and individually members of it. And finally, you and Deb will, I hope, give me a call when Deb needs a rest, or goes out of town, because I will miss being here with you on Sunday mornings. You have been a gift beyond measure to me during a time of transition in my life. You welcomed me with open arms and sang my unfamiliar hymns. You let my kids take up the offering without asking, and you told me your stories. It’s been a good run, I think, and I hope that we will not lose touch. The season in Advent begins with the recognition that our world is in turmoil… acknowledges that there are forces working against God and God’s intentions for humanity and for Creation. The season of Advent begins in the dark. It does not begin with Black Friday or Cyber Monday. It does not begin with the purchasing of the Christmas tree or the hanging of the wreath. Advent begins in our own, troubled realities. Advent begins with die-ins on school campuses and city streets, with banners reading “Black Lives Matter.” Advent begins with the re-fracturing of a society already shattered by mistrust between civilians and police, between communities both black and white, between politicians and clergy, between neighbors, between friends. Advent begins, as it did two years ago, with water-logged houses and mildew, lost homes, flooded sanctuaries and flooded schools. Advent begins with the uncontrollable spread of disease in West Africa, with preventable infant and maternal mortality, with stomach-turning ubiquity of gun violence, with job loss and high-interest loans, with drone strikes and suicide bombs. And so, week by week, our task is to light a candle, pushing the darkness back and nurturing the fragile light of one, flickering flame, to reveal the light that will shine in the darkness and the darkness cannot overcome it. Last week, you may have lit a candle for hope, which is a good place to begin, for hope is the antidote for despair. Hope sets us on a path; hope attunes our hearts to the possibility of something beyond our own reckoning that will offer us release from our suffering. And so the candle of hope burns brightly. This week, we light the candle for peace, planting our feet firmly on the side of God’s kingdom of reconciliation, where steadfast love and faithfulness will meet… where righteousness and peace will kiss each other. We will look around at the innumerable places where peace is absent, and we will stake our claim in the sure confidence that peace is ours to make through the power of God. It is there to be found, if the eyes of our hearts are willing to look. I saw steadfast love and faithfulness meet on a street in Portland, Oregon last week. Maybe you did to? It was a picture of 12 year-old Devonte Hart and Sergeant Bret Barnum in the midst of a heartfelt embrace just a few days after a grand jury’s decision not to indict Ferguson police Officer Darren Wilson for the death of Michael Brown. Devonte, who is African American, has tears rolling down his young face. He had come to a protest rally in Portland, Oregon with his mother, and he carried a cardboard sign bearing the words, “Free Hugs.” Sergeant Barnum, who is white, was at the rally to keep the peace and noticed that Devonte was crying. The police officer walked up to the young boy to ask him if he was OK. Steadfast love and faithfulness met that day on the streets of Portland, and righteousness and peace shared a kiss. Advent did not begin on November 30th, not really. Because we are always in a season of waiting and anticipation; and we are always aware of a member of the body who suffers– of the darkness that threatens to overcome that fragile flame. It’s confusing, though, to think of Advent as existing all year long. It’s like that awkward line in the communion liturgy, “Christ has died. Christ is risen. Christ will come again.” It is as if the past, present and future are all collapsed upon one another, existing in the same moment. As we await the coming of the Christ child, we are also anticipating his coming again at the end of time. AND, if that’s not enough, we are also living as if Christ is among us now, in the life of the community of faith, and in the bread and cup of communion. Past and future collapsed into the present. Thankfully, our Advent task is not to explain how this all works. Our task is to LIVE IT, which might actually be harder. We have to figure out how to live ‘as if’ the glory of God is about the revealed, while at the same time preparing for God’s reappearance at the end of time AND living as if God’s glory is right here, among us now. The Gospel of Mark begins with our preparation. Not with the narrative of the babe in the manger, but with John the Baptist, looking a whole lot like the prophet Elijah, preparing the way of the Lord by calling all people to the cleansing water to lay bare the hard truths of our own mistakes. In my daughter’s kindergarten class last week, the students did a unit entitled, “Sometimes it’s hard to tell the truth.” I wasn’t there for the conversation, but I saw the outcome. Each child was given an index card that said on one side, “Sometimes it’s hard to tell the truth.” On the other side of the card, the children had written, or the teacher transcribed, a truth that was hard to tell. A length of yarn was tied to the card, and the cards were hung above the tables in their classroom. 18 hard truths laid bare for all to see. Claire’s, unsurprisingly, said, “Sometimes I push my brother.” A boy in her class shared a lengthy narrative about breaking his father’s stereo and lying about it. Now, none of the kids admitted to committing a crime or playing a practical joke on a parent; it was small potatoes stuff across the board. But more than the substance of their truth was the difficulty of naming it out loud. What are the hard truths that we, as Christians, must admit to? Or, what would your card say? This is part of our Advent preparation, according to Mark. As individuals and as the church, we’ve got to write down our hard truths and hang them up for God to see: I judged another person by the color of her skin or the model of his car. I turned my back on someone in need because I was too busy. I chose to do the easy thing; not the right thing. I didn’t march in the protest because I didn’t think it mattered to my life. In this way, we will prepare the way for God to come down and work salvation and reconciliation among us— by declaring the absence of peace in our lives and for seeking forgiveness for all those times when we have chosen the opposite of peace. And then there is Peter, writing on the other side of Christ’s birth, ministry, death and resurrection, reminding us that we are still in Advent’s anticipation for Christ’s return and are still caught in the human dilemma of being constant and steadfast in times of turmoil and darkness. ‘Be ready,’ he says. ‘How do you want to look when the Christ returns? Like withered grass and faded flower? How do you want to spend this between-time? In darkness? No. You want to be found by Christ at peace with yourselves and one another. And by the way, remember that God is patient with you, not wanting any to perish.’ God wants all to survive and to flourish. God’s salvation won’t be complete if we are not ALL a part of it. God’s salvation won’t be complete if we are not ALL a part of it. That is why Advent represents the already AND the not yet. Through Christ, we have all received the unconditional invitation for salvation. And yet, we continue to let members of the body suffer. A colleague has suggested that to be holy is to belong to God; to be complete; to be pure; and to be beautiful. That is where we are aiming this Advent journey– to make ourselves, our community and our world holy. To live as if we can achieve a holy community. To live as if steadfast love and faithfulness can meet on every street corner, and righteousness and peace kiss at every gathering of unlikely partners. To live as if the path in our own wilderness is not treacherous, steep and windy, but instead straight and flat. To live as if true and lasting peace is possible, even now. To live each and every day as if the day of the Lord is upon us. To live in the enduring ‘already and not yet’ of God’s kingdom. Advent is a long season. That means, we are given a lot of time each year to ponder the incredible power of living ‘as if.’ My family got an Advent calendar this year for the first time. It is blue with silver glitter, with a picture of two young, larger than life angels peeking into the manger. There are doves and stars and a crescent moon, and animals. And the holy family, of course, looking small and fragile in the midst of so much glory. Each tiny door reveals an Advent Scripture passage. No chocolate in this one! It feels like it is taking forever to open all those doors, and it is the first thing Claire does when she wakes up in the morning. Rushing into the kitchen to open that little door and reveal another bit of the mystery of Christmas. [ii] Thank you, Rev. Aimee Moiso! This entry was posted in Discipleship, Sermons and tagged Advent, disaster relief, hope, peace, Presbyterian Disaster Assistance, sermon, Superstorm Sandy. Bookmark the permalink.